the year book section of the site is my new favorite thing! Freak, the more I think about it, the more I agree with you. This is an absolute treat to see things like this. It keeps me young and vibrant!!!!! 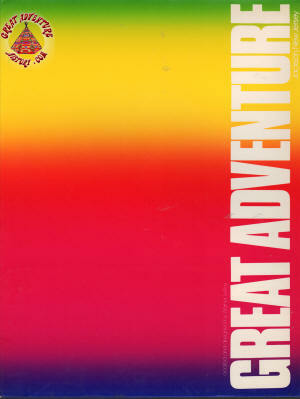 Robert Freeman joined Great Adventure as their head man in 1975 having come from Six Flags Over Texas. Interestingly, one of the first additions that he wanted to add to Great Adventure was an observation deck similar to the oil derreck at the Texas park. Unfortunately plans (and management) changed before this could become a reality. I agree, yearbook section is the best. My first job was on grounds in “Fun Fair”. Everyone called it New Rides section and we never found out it was Fun Fair till mid- July when new maps came out. We all called it New Rides for the next 5 years anyway. We kept all our brooms and pans behind the hot dog stand. Had a bench and a little “camp” set up. Would commander 5 gallons of ice cream from Gingerbread and eat it all night. Coming from the Giant Wheel, you take a spin on Schwabinchen, Enterprise, then the Rotor and you will be guaranteed to hurl. We went through cases of Z-Goup ( treated sawdust to absorb almost anything). The new bathroom had air-conditioning, none of the other bathrooms in the park did then. 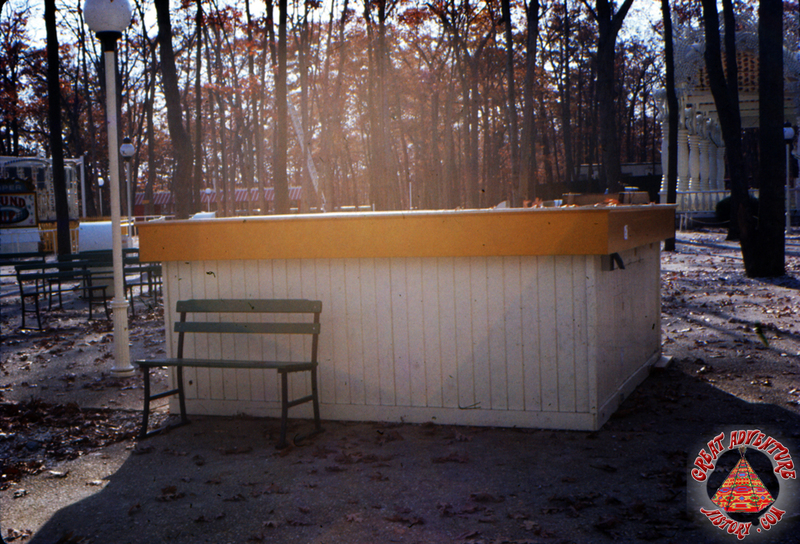 Employees from all over the park would come to use it (and sneak a quick cigarette). In July the park stayed open till midnight on weekends. The first night open late, at 10:30 every rabbit, squirrel and even a deer came out on the path between the bathroom and Gingerbread to eat. I guess they were used to the park being closed then. The first 3 years there was no employee dining, so we just ate in the park. If you look at the crowd at the Pizza stand, you can see some of the employees eating at a table in the middle. It's funny but when I worked at the park in the late 80's they still called that area "New Rides". I find these Yearbook Spotlights to be the most rewarding to put together. I love the way they tie in everything and provide a snapshot of a season. Question... Do you recall from your time in Fun Fair if the Matterhorn or Enterprise cars traveled in reverse? Just added - the 1975 Employee Handbook! A lot of interesting stuff inside! The Matterhorn did travel in both directions. But the Enterprise did not. 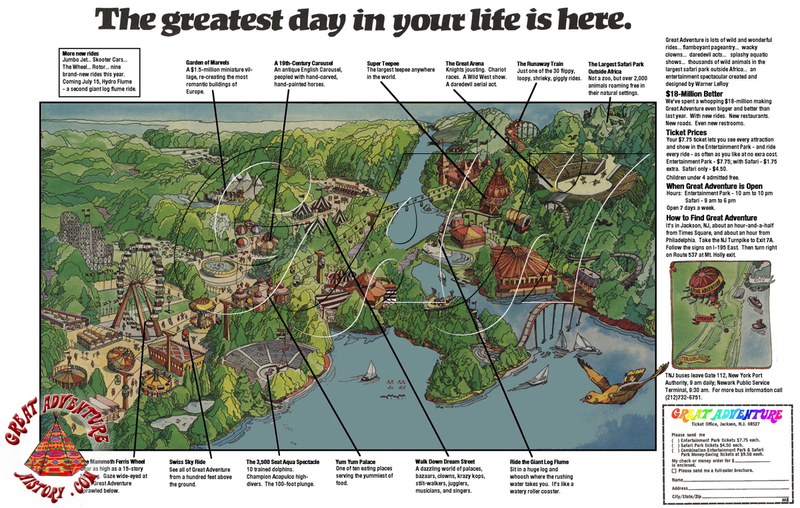 Two things are a mystery to me on this map - number 39 (a bandstand between the Giant Wheel and Gingerbread Fancy) and number 60 (a bandstand near the Fort). Anyone have any recollection of these two items? ^ I can't agree more. 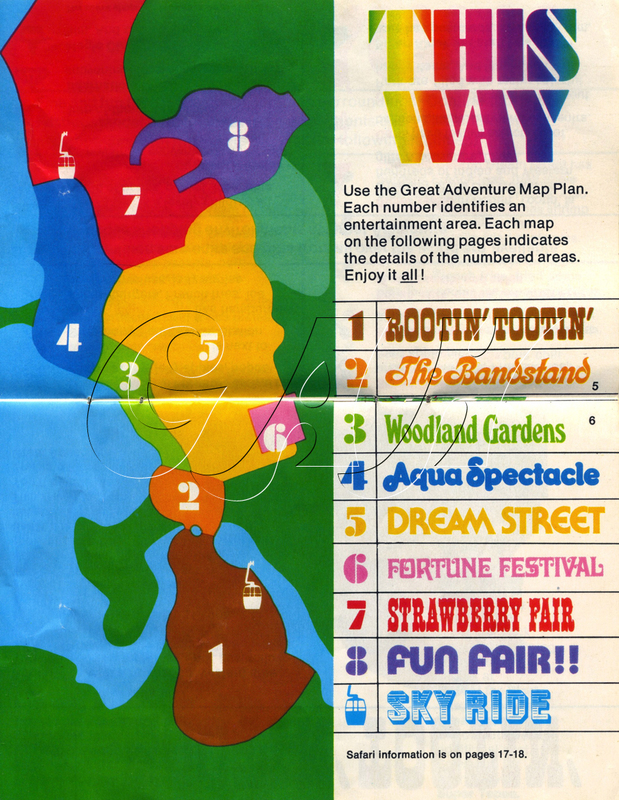 I remember my first visits to the park in 74 and 75 being "magical"! 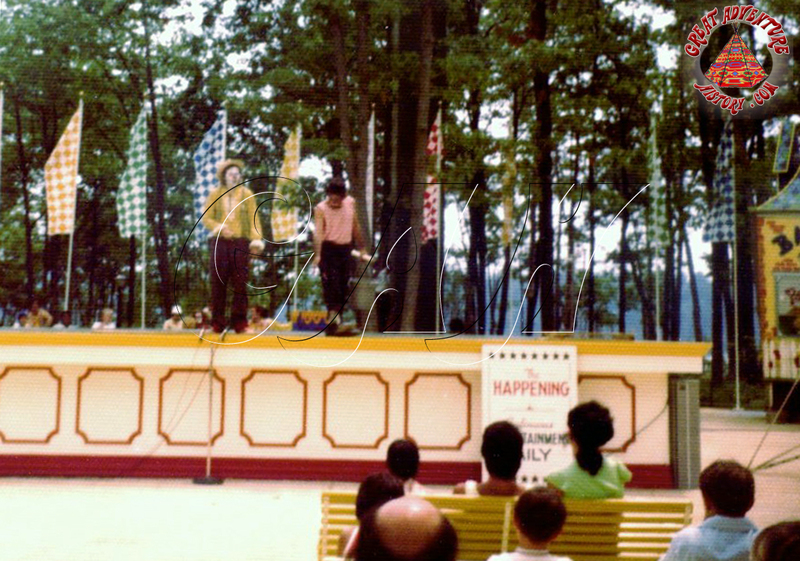 Were the Gingerbread and Fort bandstands just simple elevated wooden platforms without a roof similar to The Happening stage? Well yes and no. The Bandstand by Gingerbread was a roof over very much like the Fun Fair but with a lot of trim. The one in front of Super Teepee was a platformed affair in dark brown. Looking at the above pictures Id say yes. The Bandstand by Ginger Bread Fancy was located to the left as you came of Big Wheel and sat in the gardens in front of it. And heres a little known fact. the openning week of 1975 saw all the parks plant beds featureing Giant Dutch Tulips. ^ Interesting. I don't recall that covered bandstand and will have to be on the lookout for a photo. I know we don't have one. 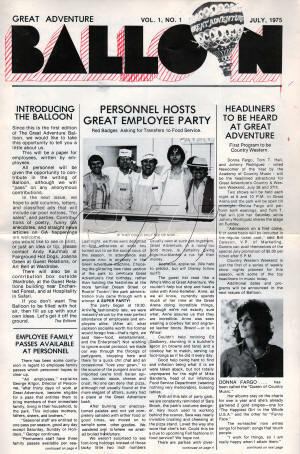 Two new employee newsletters from 1975 (covers below) have been added to the 1975 Part of the Cast page. 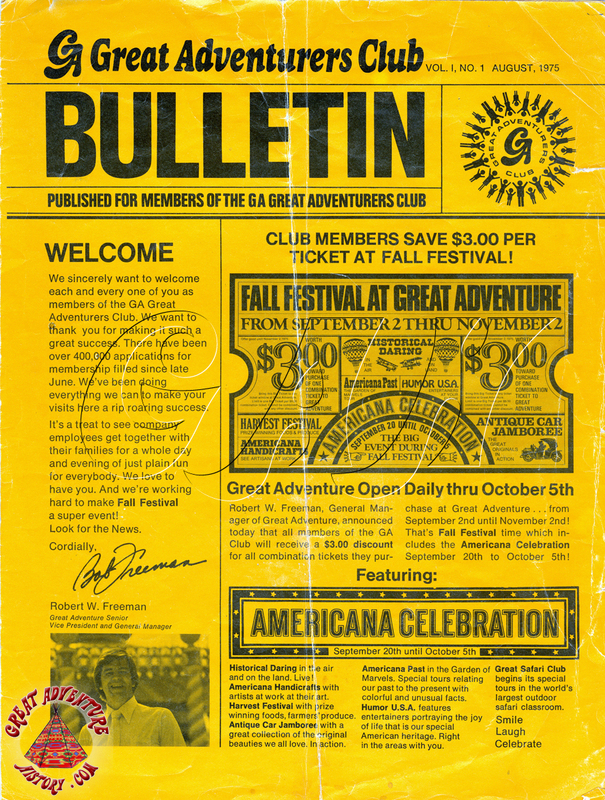 They provide for some interesting reading and some humor which would probably be frowned upon in today's society- things like loosening bolts on the ferris wheel, taking cable cutters to the Skyride, and adding strychnine to food to make a dinner at the park a true Great Adventure! All in good fun of course! 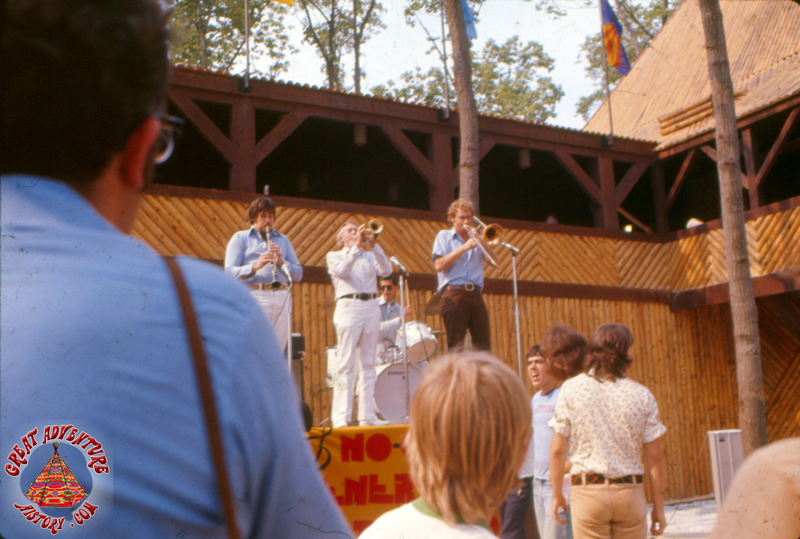 I recently obtained two photos from 1975 which show the bandstands in Strawberry Fair and Rootin' Tootin' Rip Roarin'. It looks like it would have been really easy to fall off the stages! OK, that must be where the (African?) dance group is performing in the Greatest Day of Your Life commercial. I was trying to figure out why Runaway Train was behind the family when the lady in the grass skirt and shell bra was dancing. 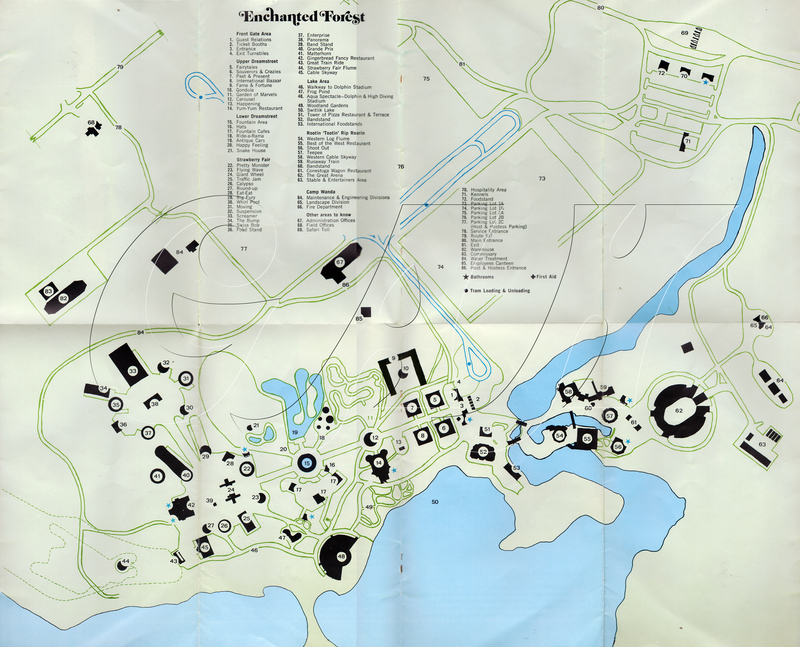 Does anyone know what #83 was on this 1975 map. It says Commissary - was it employee dining or something? Say What? We were still eatting in the tents behind games. 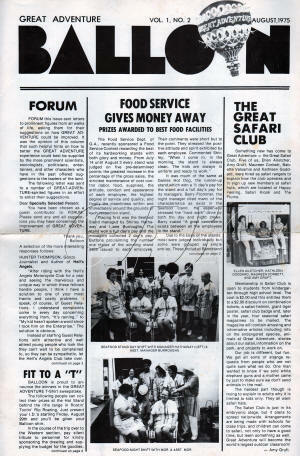 NO- It was Not employee dining.. Food Services used a centralized food prep area as a distribution facility between the Warehouse and the individual foodstands in the park...The Comissary. 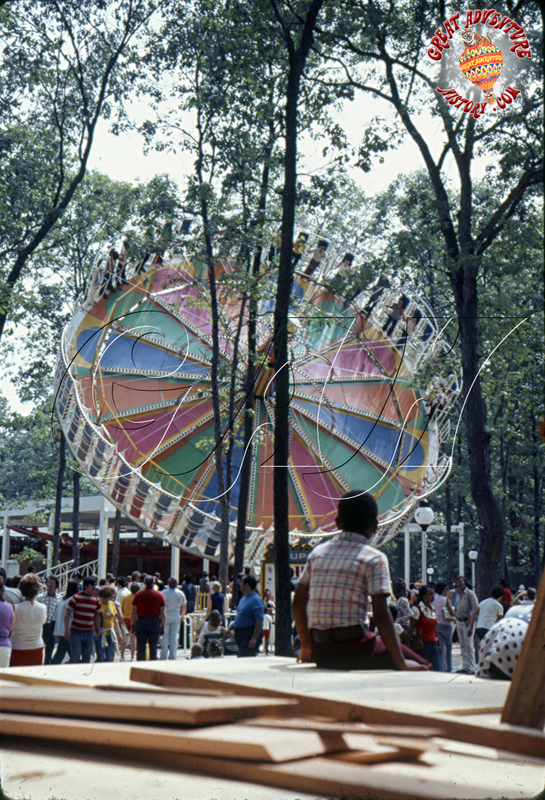 It was located out next to the Water Treatment facility behind Gate 4 for those first few years, before the expansion of Strawberry Fair into the "New Rides area" in that far Northwestern corner of the Park. I don't recall if they moved it, or changed the concept of warehouse to foodstand supply--it might have happened after I left in 1978. I do know the smell from the water treatment plant made wanting to eat anything in the comissary area not very pleasant, when we had a call about fence jumpers out there. 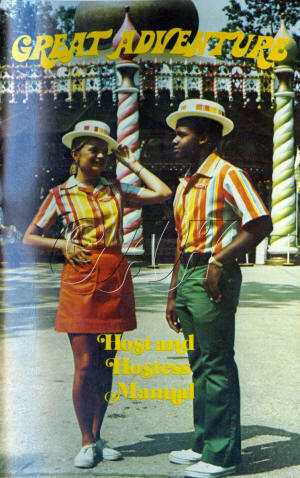 Just added to the 1975 Park Brochures page is a pamphlet for Group Sales. Click below to check out this rather rare pamphlet. 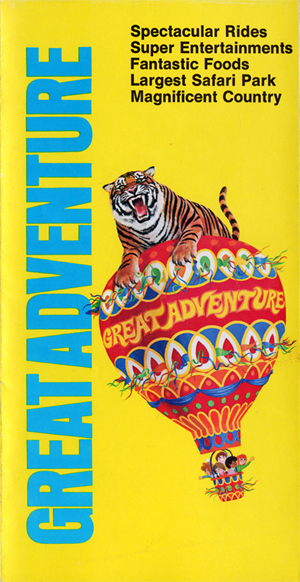 Ever wonder what Great Adventure's 1975 press pack looked like, well here it is! Pretty simple but it pretty much matched the style of the park name used on the souvenir booklet, poster park map, and bumper sticker from that season. Click the cover to see additional content from the press kit. Love this stuff! Interesting that park management chose Magic Mountain's Jet Stream to represent the park's new Hydro Flume for the 1975 season. According to a reporter's notes I have from an interview he did with Robert Minick (VP Ride Operations in 1975), the Hydro Flume was going to be the third installation of that style ride in the US. I assume the first two were Magic Mountain's Jet Stream and Hersheypark's Coal Cracker. That is correct, although the two flumes were not installed for the same seasons. Magic Mountain's Jet Stream was first. Introduced in 1972, it was both the first hydroflume installation and the first Arrow flume to utilize the turntable design for loading and unloading passengers. 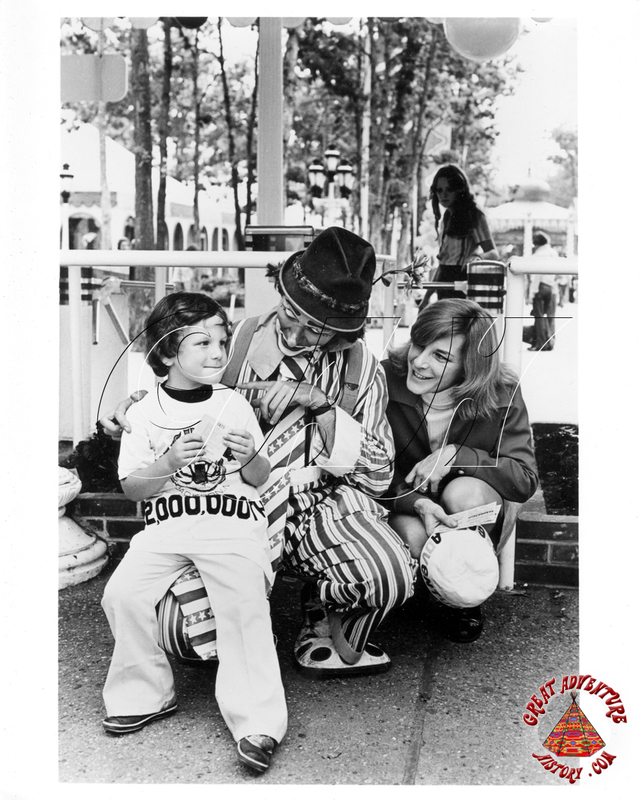 Hersheypark introduced their Coal Cracker for the 1973 season.